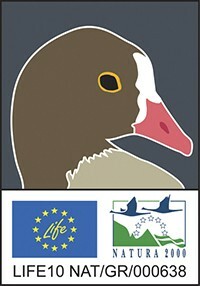 The Lesser White-fronted Goose Life project (officially “Safeguarding the Lesser White-fronted Goose Fennoscandian population in key wintering and staging sites within the European flyway”) was an international EU LIFE+ Nature project that aimed to halt the decline of the critically endangered Fennoscandian Lesser White-fronted Goose (LWfG) population by implementing concrete conservation actions. The project started in September 2011 and continued until April 2017. The Special publication presents the result of the project in full detail. The work and the results of a the project are summarised in the Layman's report, which is available in English and Greek languages. The main focus of the project was in wintering and staging grounds of the population in south-eastern Europe. The project implemented the recommendations of the International Single Species Action Plan for the species, and it was a direct follow-up project of the previous LIFE project “Conservation of the LWfG on the European migration route” in 2005-2009. In order to succeed in the conservation of the LWfG, efforts require a flyway approach. Thus, the project involved eight partner organisations from four European countries along the flyway. The multi-national and multi-institutional partnership played a key role in the project. The project undertook concrete actions in seven NATURA 2000 sites in Greece, Bulgaria and Hungary. The LIFE+ Nature Project “Safeguarding the Lesser White-fronted Goose Fennoscandian population in key wintering and staging sites within the European flyway” (LIFE10 NAT/GR/000638) is coordinated by the Hellenic Ornithological Society, from 2011 to 2016, in collaboration with the Forest Research Institute of the National Agricultural Research Foundation - Greece, the Ministry of Environment, Energy and Climate Change - Greece, the Bulgarian Society for the Protection of Birds (BSPB), the Hortobágy National Park Directorate - Hungary, UNEP/ African - Eurasian Migratory Waterbird Agreement Secretariat (AEWA), WWF Finland and the Natural Heritage Services of Metsähallitus - Finland, with the financial support of the European Commission and the co-financing of the Directorate of Nature management (Norway).